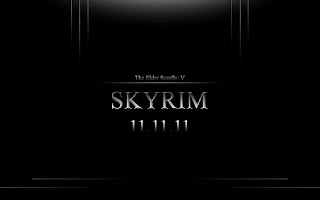 On November 11 2011 the most anticipated RPG of the year will be release The Elder Scrolls (TES) V Skyrim. After the MASSIVE success of both TES III Morrowind (set on the isles of Morrowind and its treacherous landscape) and TES IV Oblivion (set in the Empire of Tamriel with its great landscapes and deep dungeons). TES V is hoped to completely blow a hole in the RPG market and at the very least rival (if not surpass) it's predecessor. Skyrim will introduce the new enemy of the lands known to all as Alduin the dragon who will consume the world. Your quest will be to go through out the kingdoms and cities of Skyrim and slay the great dragon and gain power and wealth along the way in whatever means you see fit. The game will once again allow people to freely wonder across the great lands and do as they see fit being a saviour or a sinner. The game itself is set 200 years after the fall of the empire after the gates to oblivion (see the previous games plot) have been sealed closed by the last son of the dragonkin. The world you enter this time is much harsher and will often push you to your gaming limits (if you set it high enough). The class based system which has been completely abandoned and has been replaced with an open skill tree allowing greater freedom of development.